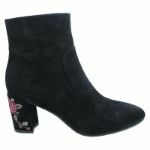 Let your heels do all the talking in these Kolt black suede ankle boots from Nu by Neo. 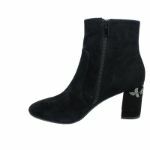 From the front, this classic black ankle boot is the perfect shape and style for every occasion, but from the back they’re injected with a hefty dose of passion and style. 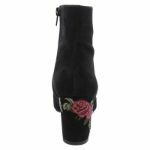 Embrace this season’s floral embroidery trend in a way that is accessible and easy to wear. 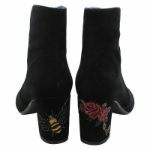 These are a fun suede boot with a true fit if a bit firm but will obviously give with wear, a little bit different shape and sweet with the embroidered design on the heal that’s only revealed to anyone behind you, a little cheeky surprise!